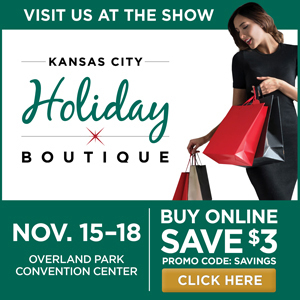 The KC Holiday Boutique does not print or mail the Exhibitor Kit. All information can be found in the Exhibitor Manual and the links below. EARLY ENTRY TO LOWER LEVEL BOOTHS BEGINS AT 9:00 AM. EXHIBITORS ON LOWER LEVEL MUST BE PRESENT AND READY FOR SHOPPERS AT THIS TIME. promoting this feature through paid TV, radio, and print advertising. Submission Form. Please provide a product image and short product description with your submission. Move-in letters with a scheduled time for each exhibitor will be mailed in October 2018. Dismantling of displays is not permitted until 5:01 pm November 18th. See Exhibitor Manual for for details. ALL BOOTHS IN THE LOWER LEVEL, BALLROOM, & FOYERS MUST BE REMOVED FROM THE BUILDING BY 10:00 PM SUNDAY NOVEMBER 18, 2018. IF YOU HAVE RENTED A STORAGE AREA IT MUST ALSO BE CLEARED BY 10:00 PM SUNDAY, NOVEMBER 18, 2018. Exhibitors are responsible for carpeting (required for all booths), tables, chairs, and wastebaskets within their exhibit spaces. Exhibitors can supply their own items or rent from the show decorator. An advanced purchase discount is offered. Click the order form button below for complete details. Storage space is very limited and available on a first-come-first-serve basis.